Among them is the only European collection of former winding machines, so-called treadmills moved by horses: the “Polish” treadmill with a horizontal windlass (17th century) and treadmills with vertical rope drums: “Saxon” (1st half of the 18th century) and “Hungarian” (2nd half of the 18th century), as well as other pieces of equipment for vertical and horizontal transport and transport in inclined drifts (e.g. the “Wieliczka” cross-shaped horse gear – 18th century, cross-shaped hand-operated gear and various types of windlasses and braking devices). The collection also includes equipment used for dewatering the mine and transporting brine, as well as lighting, ventilation and devices for automatic exploitation of the salt bed (manual, pneumatic and electric drills). 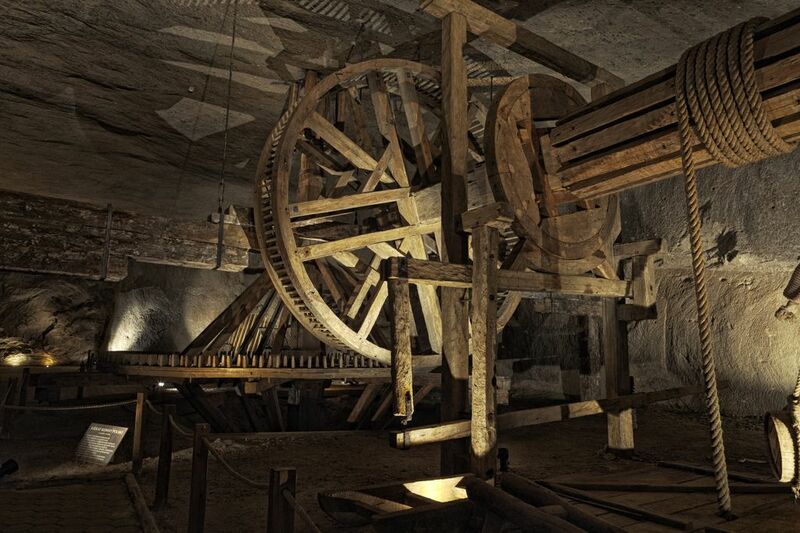 What is more, there is a significant number of mining, carpenter’s and cooper’s tools, measuring devices and various forms of salt output produced in the Wieliczka and Bochnia mines from the Middle Ages to the 19th century. Currently, the collection has 1,508 exhibits.